Reduce difficulty in handling dialysis bags with these convenient devices. Dialysis tubing is cut to length and knotted at the end. 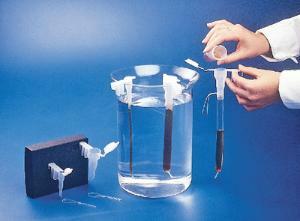 The other end is slipped onto the tube and held with rubber loops or a rubber band. Three tube steps, in 5, 9, and 13.5mm, fit various sizes of dialysis tubing and a three notched universal hanger supports the funnel on the edge of any vessel. Includes a captive cap with writing area. Steam autoclavable at 121°C. Package of 10.